Over recent years, Manchester has undergone considerable regeneration through its role as part of the Northern Powerhouse investment scheme. Best known for its music, industry, transport links and football teams, Manchester is a great place to live, work and study. House prices and rents are relatively low for a major city, and the cost of living is affordable and in keeping with local rates of pay. There’s a cheap and efficient Metro system so commuting’s easy if you live on the outskirts, and the well-connected railway will get you to pretty much anywhere in the country quickly and easily (Leeds and Liverpool are commutable for those minded to work away from their Manchester base). The M62 runs past the city making commuting or travelling by road easy too, and of course, Manchester Airport makes travelling abroad a doddle. Manchester is also home to several Safestore self-storage sites. We have eleven stores in and around Manchester, including Manchester Central, Manchester Old Trafford and Manchester Worsley as well as further afield in Stockport, Oldham, Altrincham, Bury and Bolton. If you need self-storage in Manchester we have units in a wide range of sizes from lockers to warehouses for all types of storage. Our self-storage units are secure and many of our sites have onsite parking. Some of our sites also offer office space to rent at low prices and with no lengthy lease tie-ins. Thanks to our locations close to major road and rail networks, we’re convenient if you need self-storage in Manchester or in areas including Stockport, Bolton, Bury, Oldham, Rochdale or Warrington. 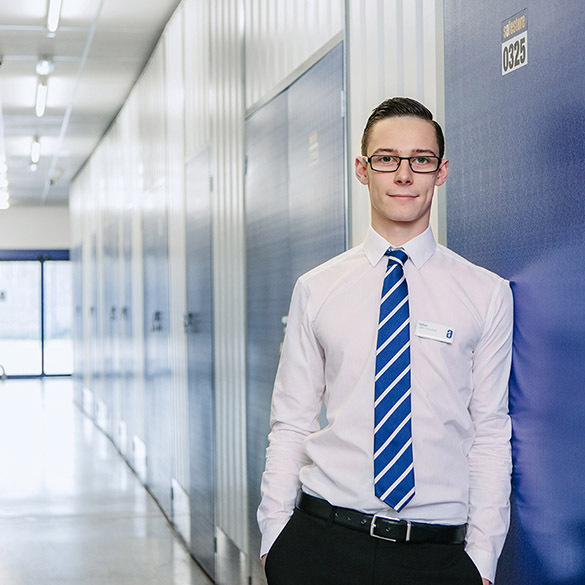 For personal, business or student storage in Manchester at low prices and flexible terms, give us a call at any of our Manchester sites, book or reserve a unit online or fill out our online contact form and we’ll call you back as soon as possible. Get a storage quote today and reserve a Manchester storage unit for free. We won't ask for a security deposit either. Get 20% off if you need self storage for longer than 12 months. Available at all Manchester Safestore centres. Terms apply. Manchester is a vibrant and colourful city that has consistently been voted one of the best cities to live in the UK. The city has a reputation for being a safe and friendly place for locals and tourists, as well as being a great spot culturally. It has an array of top universities, the world’s top football teams, a rich history of music and entertainment and is a growing hub of business. There are many reasons you may need personal storage in Manchester, and we have units to suit any need. Whether you’re in the city for one of it’s brilliant universities, have recently relocated to the area, or are undergoing some home renovations, we have a number of short term, long term units at varying sizes. Manchester is a Northern powerhouse when it comes to business. It has become a thriving hub for small and large businesses alike, meaning more and more people are flocking to the city. Being the second largest city economy in the UK, the opportunities to be found here are plentiful. There are many resources to be found in the form of three excellent Universities and the cost of living and overheads is substantially lower than that of London. Full of creatives and start-up businesses, the city has become known as a place of innovation, where digital and traditional work happens in harmony. If you’ve recently moved or created your business in Manchester and need space for stock, equipment, promotional material or archived documents there are plenty of units to choose from that will suit your specific needs. The North is renowned for being a friendly place and our professional advisors in store and on the phone embody just that. Manchester advisors are experts in their field and can help you every step of the way through your storage journey. Safestores, in Manchester and beyond, are proud to have been awarded a ‘Gold Trusted Merchant’ award in 2014, 2015 and 2016 by Feefo (an independant customer tracking system for businesses), commending our ability and commitment to making customers happy.